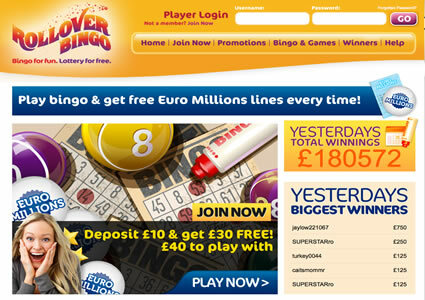 Ever heard of a bingo site teaming up with the National Lottery? Rollover Bingo is the only Internet bingo site offering free lottery tickets as you play, and that could mean you are walking away with more than a bingo win. This brand is like a few others runs on the 888 Holdings/Globalcom software so you can expect similarities between this site and some like Mirror Bingo for instance; those being a distinct lack of promotions which seems to be a regular occurrence with brands operating on the CashCade Network. Still, you’ve got to give Rollover Bingo thumbs up for their daily guaranteed jackpots and forefront promotion – free lottery tickets! Of course before you can get your hands on your lottery tickets, or your bingo tickets for that matter, you’ll need to sign up for a new account with Rollover Bingo. Thankfully, this is simple on the familiar, easy to use interface and should take you just a few moments. There are some fantastic sign up bonuses up for grabs right now, just check below see what the latest offer will be. However do note that these sign-up bonuses do change often so check what you are claiming before you make that first deposit at Rollover Bingo. 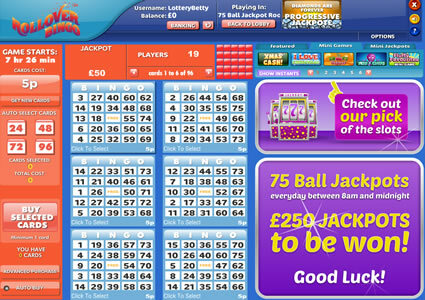 So now you’re ready to play, well there are all the usual 75 ball and 90 ball bingo games, guaranteed jackpots and bingo side games but the real edge to this site is the lottery tickets! 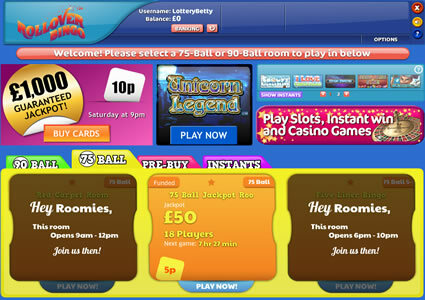 For every single £5 you spend on bingo tickets, you will receive one free Lottery line; am example Rollover use at their online site is as followed – spend £25 on bingo tickets, receive five free Lottery lines. The lottery ticket is yours but you are part of a larger syndicate, for match three and match four prizes, you will receive the whole winnings in bingo bucks, if you hit the big wins then the entire jackpot will be shared between you and the rest of the syndicate. Each Rollover Bingo syndicate has 49 members and that could mean a sizeable win if you hit the big six! Plus they say a Lottery syndicate has got 1 in 4 chances of winning. This brand isn’t a one trick pony either, there are plenty of ways to win heaps of cash, even without the lottery tickets, and those would be their guaranteed jackpots playing every single day, so check out their bingo schedule on the homepage or read that information below. 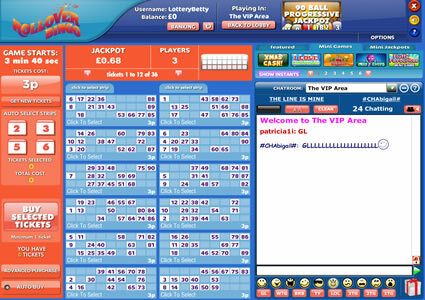 This bingo site is a winner for us, what a unique and brilliant concept, offering so much more than a bingo win. We predict that this brand is going to be a big name in internet bingo, you heard it here first! As with all Cashcade bingo sites, the game options are plentiful, auto or manual daub, caller on or off, best card first etc; all of which are handy to have a personalised gaming experience. Best thing is though, your able to change these options as much as you please so no need to worry about having the sound stuck on or off for that matter, and so on. Other than Lotto, it’s the daily jackpots Rollover Bingo offer (as stated before) that everyone’s going on about. Every night from 9pm there will be some huge guaranteed jackpot games in place with a minimum payout of £100. To never miss a game, Rollover have added these jackpot games to their Pre-Buy syndicate of prize pot specials, so simply head over to the lobby and purchase your tickets – they will be available 24/7. Plus for every ticket you purchase for the £5000 Saturday night game, you will receive one free entry into an iPad mini draw which takes place every Monday. If you’re more a fan of instant wins then there’s a whole selection of these too, you can look forward to scratchcards, slots, keno, blackjack and roulette; there’s everything you could want from an internet bingo site. Do be aware though that slots and instant games wagers do not count towards lottery ticket lines. Webform on ‘Contact Us’ page.